The festival of Chaitra Navratri is ongoing and an important day of Lakshmi Panchami will be celebrated on April 9. Also called as Shri Panchami and Shri Vrata, it is dedicated to Goddess Lakshmi. Lakshmi Devi is the goddess of wealth and prosperity and on this day a Lakshmi Puja is performed. Lakshmi Panchami falls on the fifth day during the waxing phase of the moon in the month of Chaitra, it is thus called Chaitra Shukla Paksha Panchami. Apart from Lakshmi Panchami, the day also marks the Kalpadi Tithi. 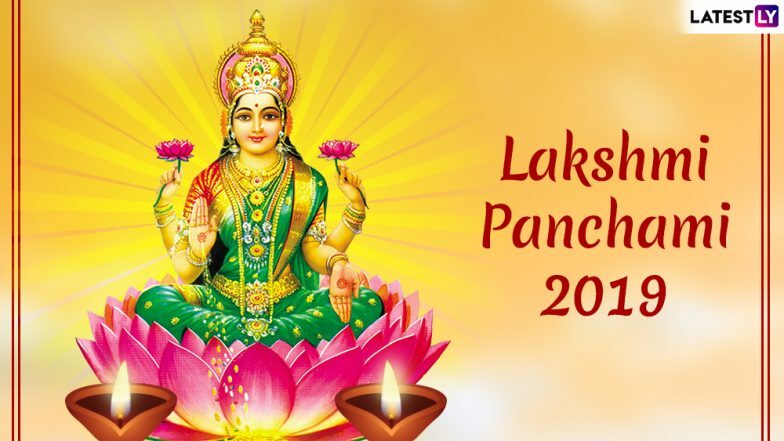 Lakshmi Panchami 2019 will fall on April 9, 2019 and we tell you more about the day, significance and the puja timings. Happy Chaitra Navratri 2019 Messages: WhatsApp Stickers, GIF Images, Wishes, SMS to Send Happy Navaratri Greetings During Nine-Day Festival. On this day, devotees keep a fast to seek blessings of Goddess Lakshmi. Performing divine worship of Goddess Lakshmi is said to eliminate poverty and helps in gaining wealth and prosperity. Business traders perform a Lakshmi Puja on this day and pray for more success in their ventures. Chaitra Navaratri 2019: The Benefits of Fasting; Why Observing Vrat or Upvas is Good for Health. Shri Lakshmi Panchami is celebrated in the first week of the Hindu new year. Goddess Lakshmi is known to bless her devotees with wealth, fortune and success. Worshipping her is said to eliminate poverty. Chanting of Lakshmi Strotra and mantra is said to help the devotees during difficult times or problems related to the profession, prosperity, business or wealth. It is believed that praying and worshipping Goddess Lakshmi on this day will never go in vain. It is the beginning of the new year for people of many communities and people always start new beginnings with seeking blessings from the Gods. Goddess Lakshmi is known to bless her devotees with fame, prestige, knowledge, strength, intellect, and other values. Thus all devotees make elaborate worship and seek blessings of the Goddess. Wish you all a Happy Lakshmi Panchami!